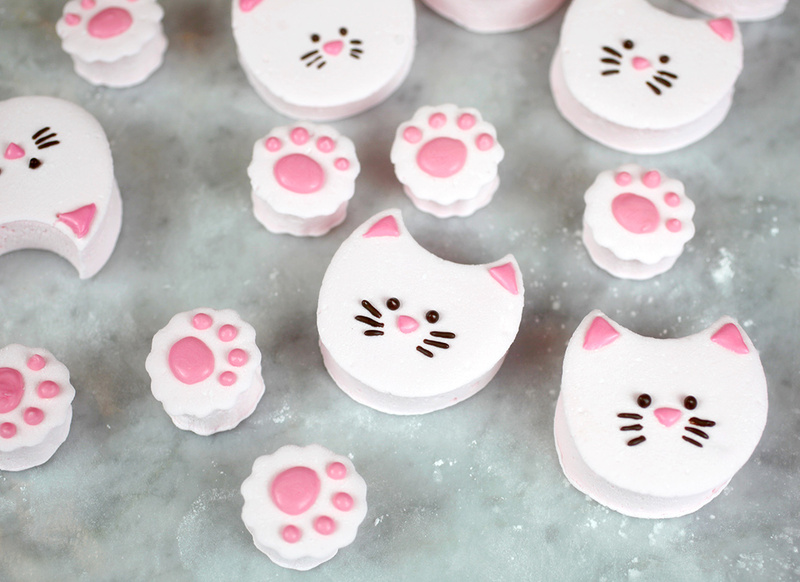 How cute are these cushy kitties! I had the urge to make marshmallows this past weekend and I intended to just dip or drizzle them in something chocolatey. 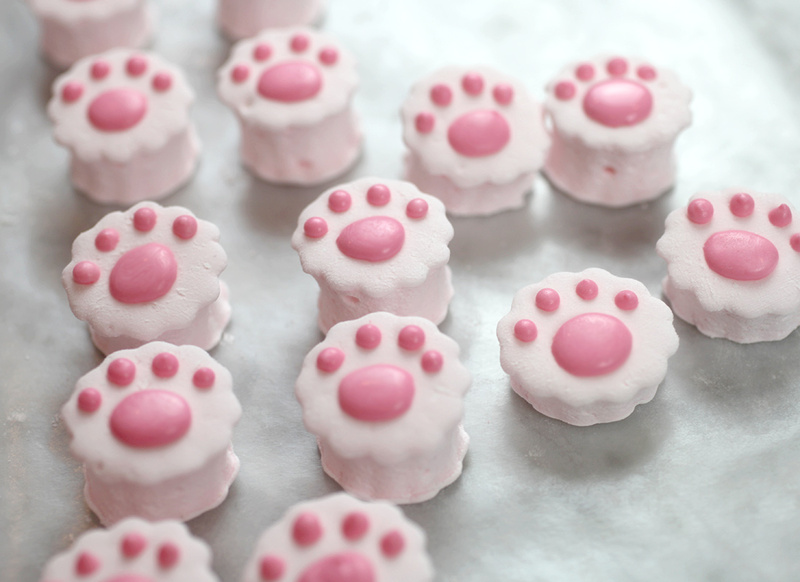 But, then… right before I cut them into squares, I changed my mind and made these little kitties and paws. Purrfect to cuddle inside your next cup of hot cocoa. You know, I think marshmallows may be the most satisfying thing I’ve ever made. 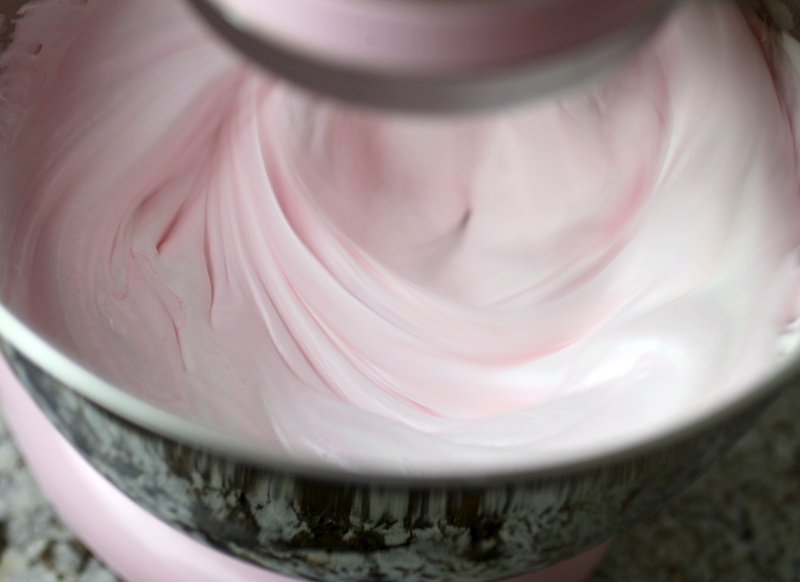 It’s beautiful to watch it come together from sugar and syrup to a soft and fluffy cloud-like confection. Once it’s poured in a pan, let it set for several hours coated in powdered sugar and corn starch to cure as it transforms from pillowy to puffy. Ahhhh… satisfaction! 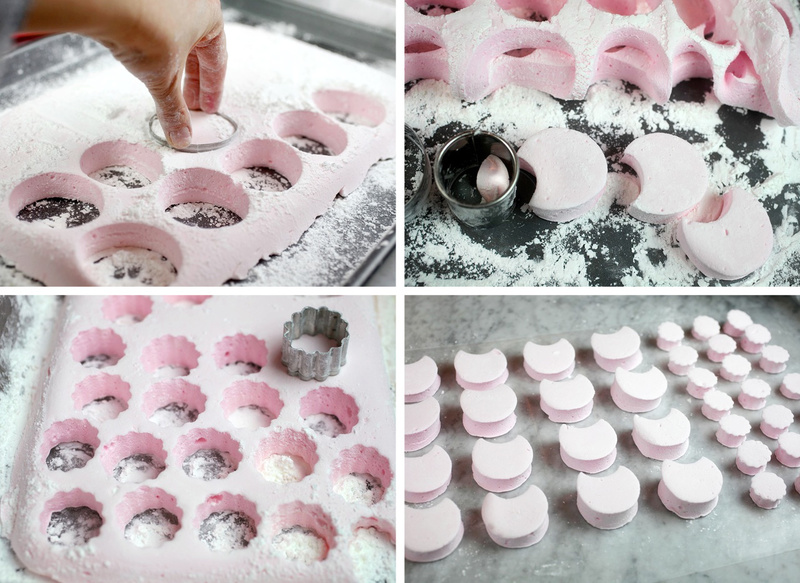 Now you can certainly cut your marshmallow into squares, but using a cutter to make shapes is even more fulfilling. I really can’t describe it adequately. I just hope you’ll try it one day if you’ve never given them a go. I could cut out shapes all day. Okay… To make the kitties, use a circle cutter about 2 inches wide. I didn’t actually have one that size so I used an egg-shaped cookie cutter. Once the shapes are cut, use a smaller circle cutter about 1.5 inches wide to remove a curved piece from the larger circle. The remaining shape is the kitty head with pointed ears. For paws, use a small round cutter about 1.25 inches wide to cut them out. Make sure all the newly cut and exposed sides are also coated in powdered sugar. Now you you’re ready to decorate. Dip a toothpick in melted smooth pink candy coating and draw one big circle and four toes on each small circle. For the faces, draw on more pink melted coating for the ears and nose. And then draw on whiskers and eyes with melted chocolate candy coating. 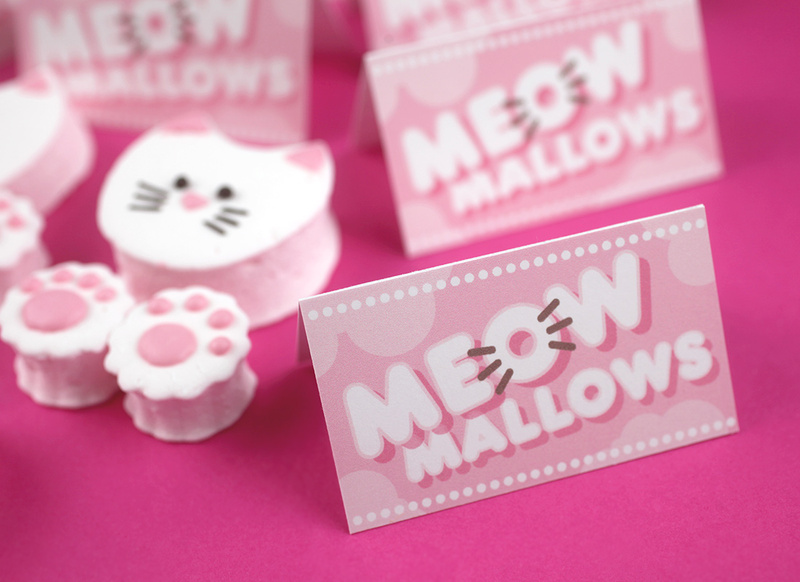 But if you’re not putting these in a cup of cocoa any time soon, then you can package them using these super cute meowmallow tags I made for you. 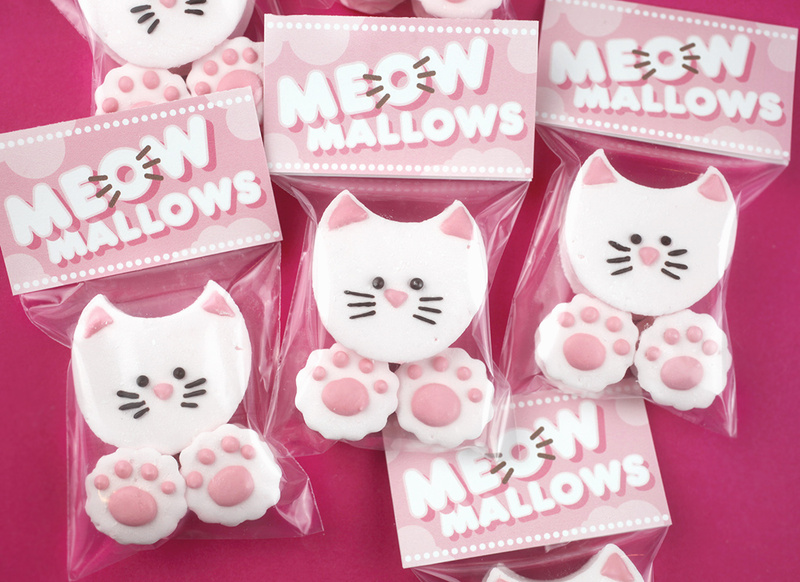 Download the Meowmallows Tags here. Dying!!! Definitely even cuter all squished in a tiny treat bag. You can staple the tags on 3 X 5 inch bags or use double-sided tape if you don’t want staples to show. Whisk gelatine and cold water together in a small bowl and set aside to soften for about 10 minutes. In a small saucepan, combine sugar, golden syrup, remaining water and salt over medium high heat. Clip a sugar thermometer to the side of the pan and cook, stirring occasionally until the mixture reaches 116 degrees C (240F). Before the temperature reaches 116 degrees, place the gelatine mixture in the microwave for about 20 seconds on high and then pour into the metal bowl of a stand mixer with the whisk attachment in place. Turn the mixer on the lowest speed. 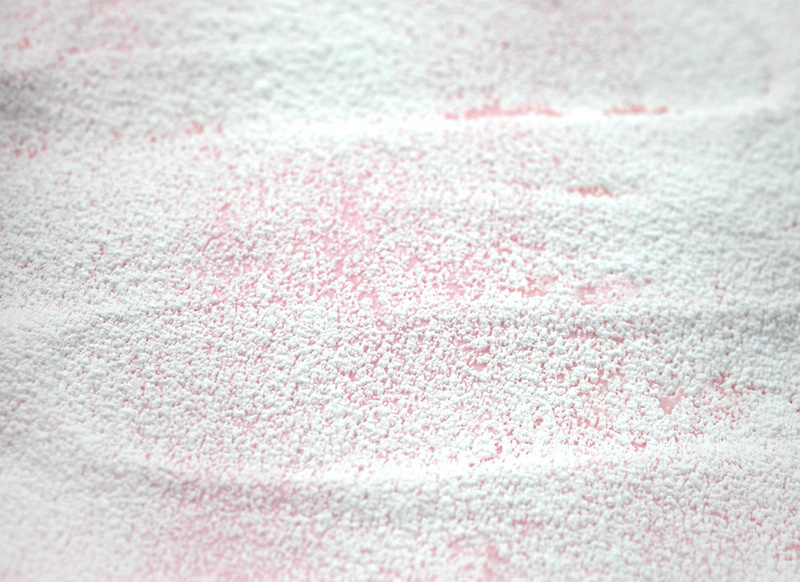 Once the sugar syrup reaches 116 C, immediately remove from heat and carefully pour the sugar syrup into the mixing bowl containing the gelatine mixture. Increase mixer speed to medium and beat for about 5 minutes. Increase speed to medium high and beat for another 5 minutes. Add the vanilla and any food colouring and beat on high for one more minute. Immediately pour the marshmallow mixture (messy) into prepared pan or pans. Spread evenly with a lightly oiled spatula or palette knife. Sift powdered sugar and cornflour together and coat the top of the marshmallow. Reserve remaining mixture. 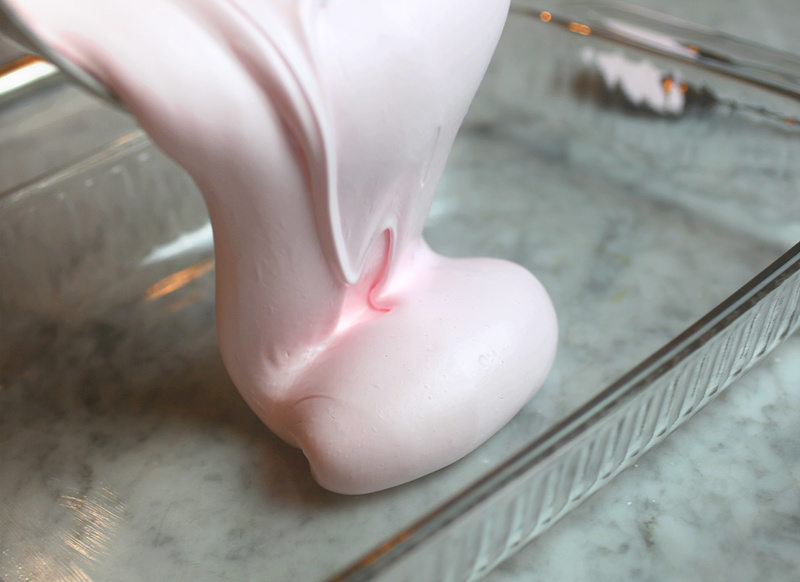 Let the coated marshmallow sit uncovered for 5 hours or overnight before cutting. When ready to cut, gently lift marshmallow out of pan and place coated side down on a baking sheet with the bottom of the sheet also lightly coated with the powdered sugar mixture. Now coat the exposed marshmallow with more of the mixture and you’re ready to cut into squares (or kitten shapes.) Use reserved powdered sugar to also coat the sides exposed after cutting. When all sides are completely coated, brush off any excess. 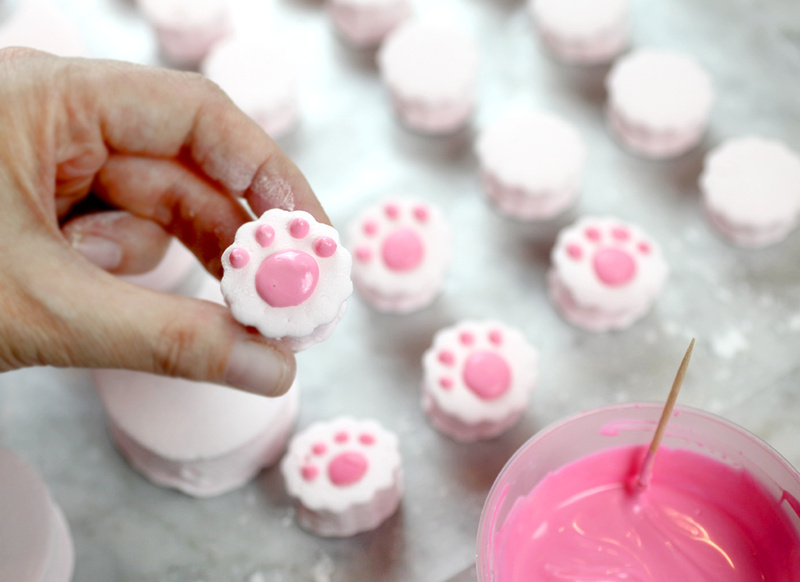 Decorate paws and faces with a toothpick dipped in melted pink and chocolate icing.